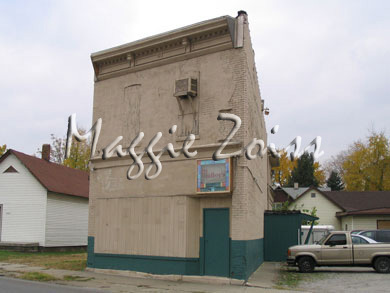 In July of this year (2005), I purchased a building in Terre Haute Indiana that is 100+ years old. Since that time there have been many "run-ins" with a ghost--experienced by several different people. Some were non-believers in the beginning, but have since changed their minds. The experiences (mostly upstairs, but not exclusively) include such events as: loud footsteps crossing the upper floor and fading away when no one was upstairs, a ceiling tile that was propped against a wall lifting up and laying back down twice (like it was being nudged away from the wall), a shadowy shape moving through the room, a sound like a trunk being dragged across the upper floor (there was no trunk or anyone upstairs), cold spots that move, the feeling of being brushed against. The main entrance door has opened on its own, the door chime ringing when the door wasn't opened and it was followed by "someone" seen on the security camera but not by the person sitting at the bar... unfortuantely, there was no tape connected to the camera. 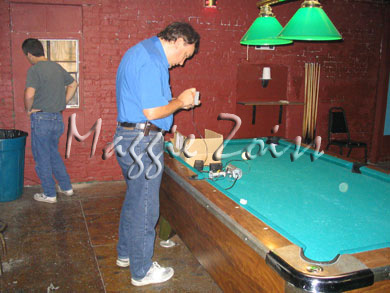 Pool balls have been seen changing direction for no reason (experienced by several very good pool players), a sound like a box being dropped (caught on tape), orbs caught on tape, a foos ball rod moving on its own, orbs seemingly responding to commands on camera, cameras going unexplainably out of focus, and the feeling of being followed. The activity is VERY frequent. In the 3 months I've had the building there have been 11 "major events" (audible sounds, visual sightings, moving objects...) and many repeated "minor events" (feelings of being followed, feeling brushed against...). I don't know the full history of the building, but I do know that it has been a bar (7 different owners) since at least the 1950s, if not earlier. What it was originally, I don't know. At one time there was another building attached, but it burned down and was removed. Our parking lot was the site of that building. Three employees and two patrons are the main witnesses to the activity. Re the orb responding on camera: We were video taping in the room with the most activity. We were picking up lots of orb activity. At one point the camera was sitting on a ledge, pointed into the pool hall. The cameraman was standing away from the camera. He said, "If you're with us, move toward the light on the camera." Within 2 seconds an orb came out of the side of the nearest pool table and moved directly toward the camera! The building was possibly an old telephone company, it is now located on Lafayette Street which used to be highway 41, and before that was an original coal route. 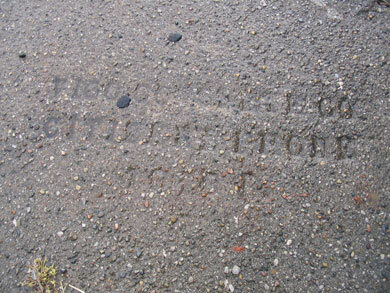 There are old coal shafts under many of the streets and buildings. The building next door burnt down at least 30 years ago, and the bar moved to the present building. It was called Alabis and was possibly a speakeasy. The owner considers herself sensitive, as do many women in her family, her Grandmother helped the police solve crimes. Sarah stops balls from going in the pockets in pool room upstairs. They stop right before falling into the pocket, as if someone had "caught" the ball (no bounce). Heavy footsteps are heard overhead, from first floor. 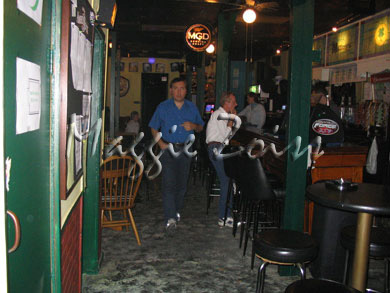 A man in a yellow shirt was seen sitting at the end of the bar on a monitor upstairs, but no one in the room saw him. A bartender has had the sensation of being followed down the stairs. Patrons have had the feeling of someone brushing up against them when no one was there. An employee was supposed to work in the building, but returned shortly after leaving, said he heard a thump and dragging (like a heavy trunk) upstairs. Many witnesses claim to see a shimmer in the air, which seems to have an awareness. An example of this would be the heat rising off of hot pavement in the distance. Tim saw something move between the pool tables and walked toward the stairs, his cell phone lit up, but no call was being received. At the same time the battery on Tracy’s video recorder died, but was supposed to have 40+ minutes left. 5:30-6:00 p.m. Karyn noticed a fog or mist forming between two of the pool tables, this was not seen by the camera, but it was associated with a temperature change (that was not picked up with equipment). Tracy heard a thump (like a chair moving) behind him in the raised section of the pool room. Then Tim noticed a shadow in the back corner, and the area of cooler temperature appear to move to the back room. At least one spirit seems to be associated with the owners as a family member. Sarah MacKenzie, possibly age 10. May have died on or near the street. The bar in the current building may be from the 1920s or earlier. It came with the building. There is a building addition on the back, one of the spirits associated with the building walks to the doorway and stops at the end of the original house. 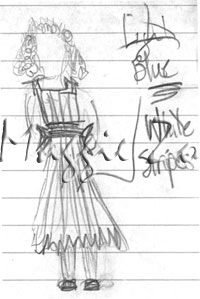 The spirit attached to Karyn follows her to the back room. A feeling of horses was picked up in the back room. Also, an uneasy feeling like energy was being blocked. There may have been problems with construction of the addition. A sense of a brawl or fist-fight was strong in the back room. Then the owners told us the building used to be a gay bar, and patrons would get jumped after leaving the building.